Compression Moulding Suits Flexible Low Volume Production Parts. South West Trains sought our assistance to design and manufacture a flexible shroud – a new component to fit over the high powered water jet hanging below a special train that clears leaves from the track. The force of the water jet is so powerful and abrasive that after hitting the rails the spray causes excessive damage to the train’s wheels resulting in additional maintenance and servicing costs. South West Trains were looking to reduce the amount of damage by the addition of a protective shroud and see a financial saving as a result. Timing was critical with this project as October to mid-December was the only time in which a prototype concept could be tested due to leaf falling being seasonal! South West Trains came to us in the summer of 2015 with initial thoughts in sketch format. We were asked to develop a solution for prototyping and subsequent low volume production. Plunkett Associates gave a cost breakdown for design & development, supply of prototypes and for the manufacture of production parts. The conceptual design was developed and approved over several weeks, 3D CAD data was produced and the first prototypes (of 3) were tested in the autumn of that year. Due to the nature of the part and the material properties required, the prototypes were made very differently to the proposed production method. Testing of the design, the material and how is stood up to the challenging environment under a train, close to the rail with a water jet running at 1500bar was the priority. The material selected was a neoprene for toughness and flexibility. For the prototype sheet material was bolted onto a stainless steel plate and then attached to the train’s jet pipe with clamping blocks; allowing it to be easily assembled and removed during evaluation. Testing involved the train making numerous journeys around a standard route for 90 minutes at various times of the day and night with the water jet running non-stop. CCTV cameras rigged up below the train recorded the shroud in action and were later used to evaluate the effectiveness of the prototype by comparing it with video of an un-shrouded test. Plunkett Associates then had 9 months to refine the design into a production solution that replicated the performance of the prototypes and met rail safety approval. 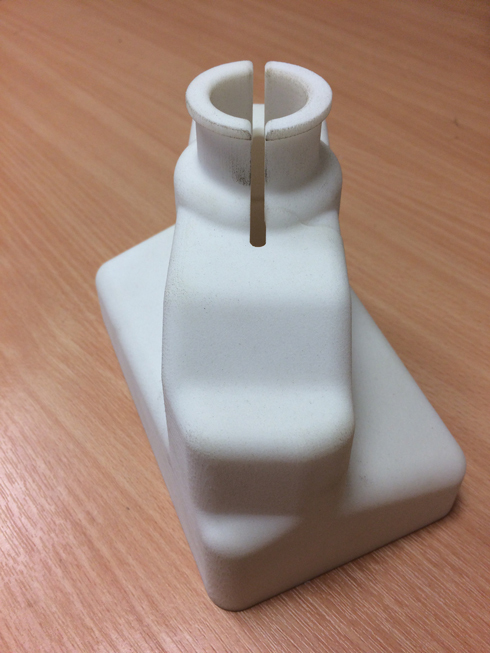 A compression mould tool was made in the UK for the production parts, and first off samples were ready for renewed testing in autumn 2016. Initial findings were that the shroud made a significant difference to the level of wear on the wheels and servicing requirements had been much reduced. A 28% increase in the time required between servicing of wheels was reported. South West Trains are now planning to extend the use of the shroud to other areas of the country with the hope that this design will make a big difference to the long term servicing requirements associated with the autumn leaf clearing period. Compression Moulding is a great process that is commonly used for thermoset materials, such as silicone and a variety of rubbers. Injection mould tooling and CNC machining for low volume production parts. 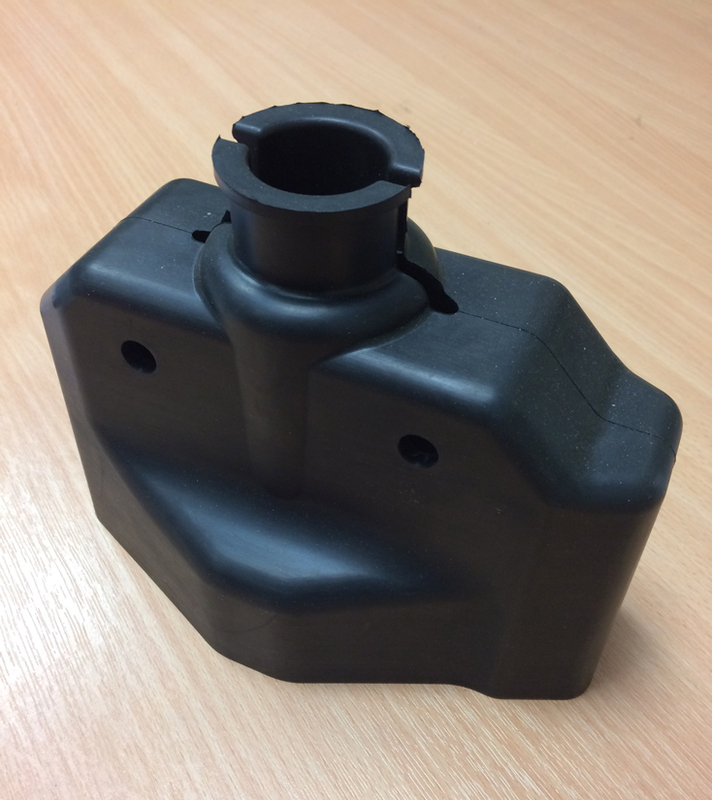 Compression Moulding ideal for low volume production rubber parts. From prototype to production, compression moulding in China provides a cost effective, high quality solution.